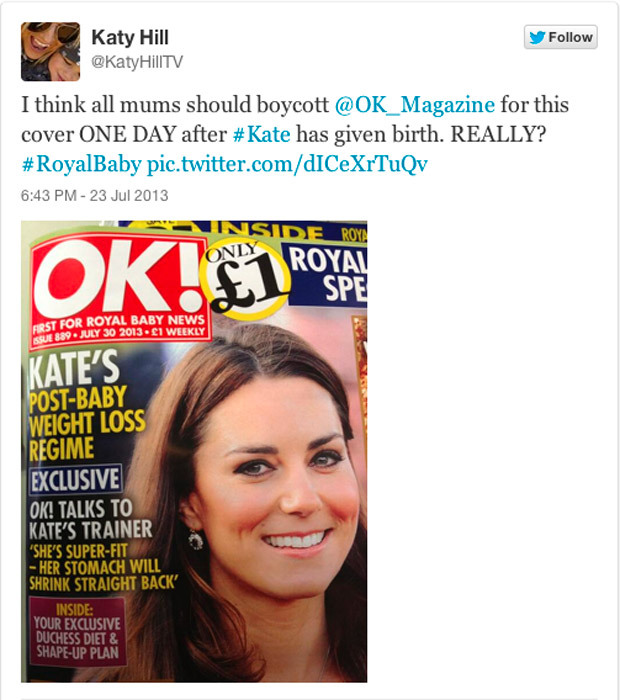 Kate Middleton has found herself at the centre of a Twitter debate following a controversial cover published by OK! magazine this week. The cover of the July 30 issue features the headline ‘Kate’s Post-Baby Weight Loss Regime’, with a tag line promoting an exclusive interview with the Duchess of Cambridge‘s trainer and the quotes ‘she’s super-fit’ and ‘her stomach will shrink straight back’. The Duchess of Cambridge was praised my mum groups for proudly showing off her post-baby bump when she debuted her newborn son Prince George to the world outside the Lindo Wing of St Mary’s Hospital in Paddington on Tuesday. Kate, who endured an 11-hour labour on Monday, wore a bespoke pastel blue polka dot dress by Jenny Packham which gathered at the waist to show off her bump. In a brave and inspiring move, Katy Hill posted an additional tweet about the OK! 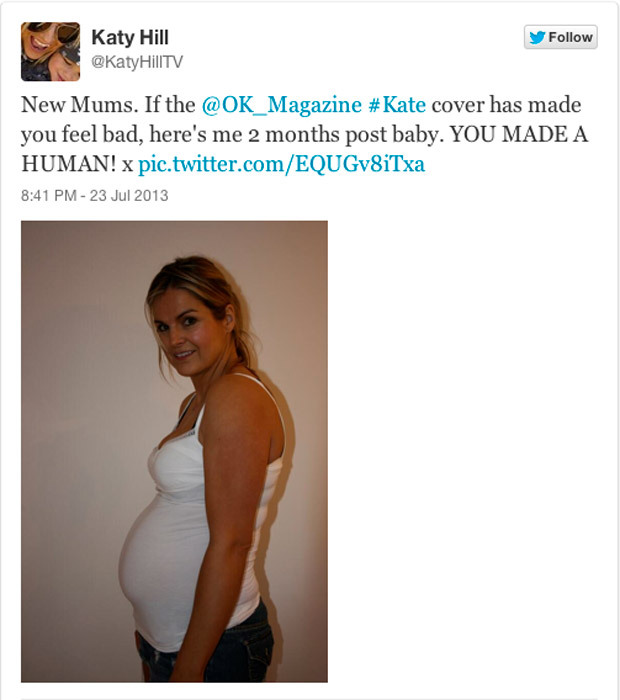 issue, sharing an image of her own post-baby bump in a tight-fitting white vest. The magazine’s company Northern & Shell later released a statement in response to the backlash. They told The Guardian: ‘Kate is one of the great beauties of our age and OK! readers love her. Let us know what you think of the cover – and Katy’s move, in the comments box below.